On April 13th Newbold CDC, Newbold Civic Association, Newbold Neighbors, and West Passyunk Civic Associtions had one of the more successfully clean-ups that we have ever had on the west side of Broad Street in years. Volunteers came out and really made a difference in our neighborhoods and around the city. When I got home from a long day of hard work, my entire street and all the surrounding blocks were littered with menus from the Broad Street Pizza and Grill. Needless to say, I was infuriated. I called the restaurant and asked them to remove the menus. I gave them about 2 hours to get it done, and they did not. So, I am taking action. I am not going to spend hours every weekend picking up the litter from local businesses whose best idea for marketing is littering our neighborhoods. So, every time I see a menu on the ground. I will take a picture and post it on this Tumblr. 1. Don’t order from these places. 2. 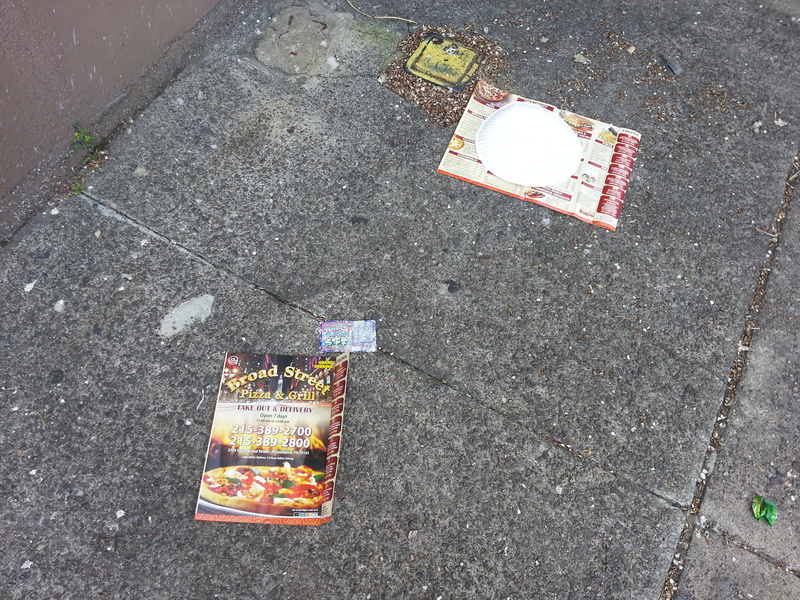 Write bad Yelp, Seamless, and Grubhub reviews for littering restaurants. My review of Broad Street Pizza and Grill already shows up in their Google results. 3. Share the tumblr posts on your Facebook pages and ask your friends to boycott litter. 4. Report these restaurants on Philly311. There are neighborhoods such as Bella Vista that have stickers on their doors telling people they’re “no flyer” zones, i’m not sure of the actual wording on the sticker but thats the idea.